Mayor Jon Mitchell is hosting a community input session for the redesign of Custom House Square on Tuesday, December 18th, 5:30 p.m. at the National Park’s Corson Building, 33 William Street. 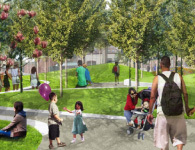 Stoss Landscape Urbanism and CDM Consultants will present concept drawings for the park’s redesign. The City is welcoming citizen input regarding the design. The Park improvement has been incubating for a long while. WHALE has participated in a number of planning efforts for the National Park and downtown in recent years. Improvement and expansion of Custom House Square has been high priority. WHALE applauds Mayor Mitchell for moving forward with the Park’s beautification. Design details must still be worked out, but the prospect of an inviting outdoor space in the midst of the downtown for residents and visitors to linger is a most positive change. New Bedford . . . NOT JUST ANYWHERE!